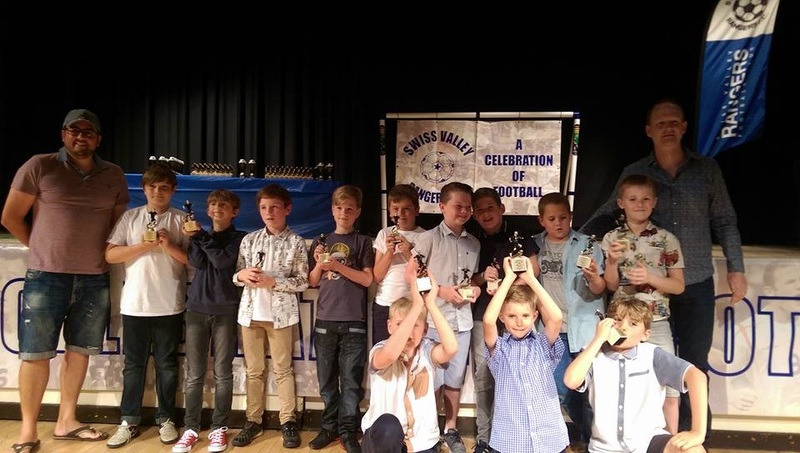 The Swiss Valley Rangers Annual Presentation evening took place at the weekend at the Somerset Hall, Portishead and brought the curtain down on a fantastic season of football. Players from across all our age groups got their moment on stage as we recognised their efforts representing the Club this season. Awards were presented by our head trainer, Paul McLoughlin. In a small, but unrehearsed change this year, some players, as they walked onto the stage to collect their awards, took the opportunity to perform the dance move of their choice. Most of them from Fortnite. Team by team we heard about everyone’s season culminating in individual awards for each age group: Manager’s Player of the Year, Most Improved Player and Players Player of the Year. Sarah Sperring (Child Welfare Officer) and Sarah Packer (Treasurer) were thanks with flowers for the work they’ve done behind the scenes to keep the Club running smoothly. Club recognition awards were given to Craig Timbrell for the fantastic work he’d one over many years, in particular over the last five years on youth development within the Club, and to Bill and Noren McKinen for the fantastic growth in girls football in the Club over the last twelve months. 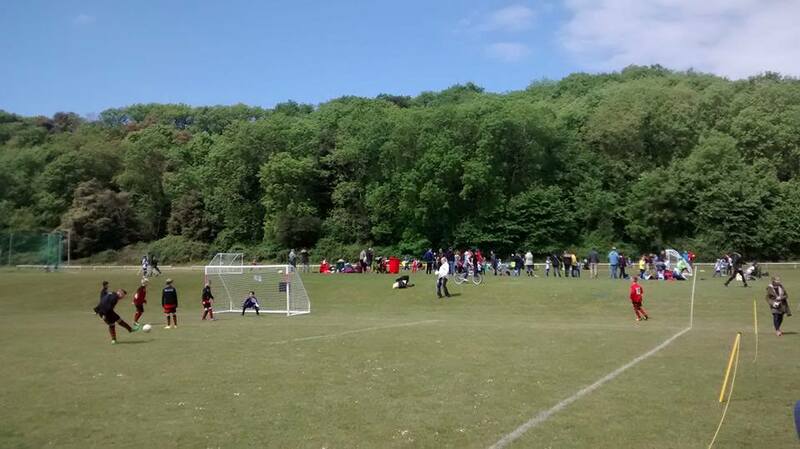 A beautiful Spring morning greeted the U10 and U11 players and parents as we held an inter-SVR friendly last Saturday. This was the U10s first experience of 9-a-side football – bigger pitch, bigger goals, offsides, no retreat from goal kicks – so the morning was about getting the boys and girls some experience of the format ahead of their first league campaign next season. For the U11s, having just come off a tough league campaign, it was an opportunity to enjoy a morning of football, with plenty of minutes on the pitch for the whole squad. Swiss Valley Rangers Football Festival back and bigger than ever! Our fourth annual Football Festival is set for 23 June 2018… and 24 June 2018!! That’s right, with the expansion of the Club we’re going to two days of football at our home ground – Clevedon Comprehensive School. From U7 to U14 boys, plus U10 to U12 girls, it’s a huge undertaking for the Club, but we’ll be delighted to host lots of teams from around North Somerset and beyond, playing the game they love. So, to all Swiss Valley Rangers parents – we’ll be talking to you soon about how you can help. To all our visitors – a few sections are already full, so time is of the essence… Apply for your space today! This year’s review and celebration of the season will take place on Saturday 30 June 2018 at the Somerset Hall, Portishead. All registered and fully subscribed players will receive a trophy and their moment on stage to recognise their contribution this season. And there’ll be the individual awards to look forward to – will this be your year!? Invitations will be out soon…. 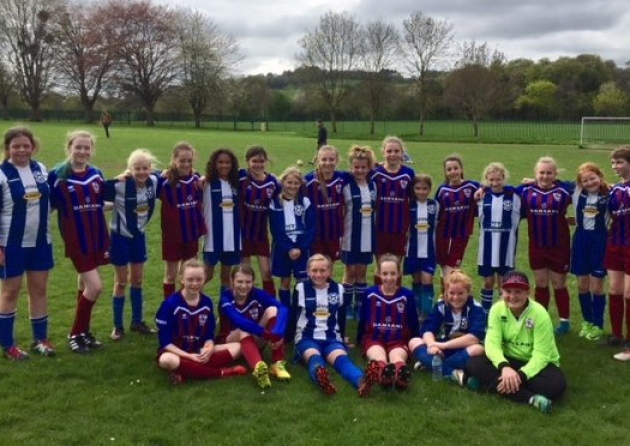 Swiss Valley Rangers Girls Under-12 won 2-1 in their last league match against Ashton Girls to earn second place in Bristol Girls League. Swiss started well and were on the front foot for most of the first-half forcing the opposition team to defend against the SVR forwards Jasmine, Cecily and Ella. SVR were also unfortunate not to take the lead with some long-range efforts from midfielders Xara and Maggie. The first goal was finished off with great composure by Ella, who also scored the second not long after. Defensively, SVR continued to close down the opposition and where they broke through, goalkeeper Nancy was there to keep the score 2-0. Ashton added relentless pressure in the second half resulting in a goal. Alise, Libby, Fern and Shannon managed to stop further attacks to help seal the win. Player of the match went to Nancy. It has been a remarkable season for these girls, given they have been playing an upper year group. The SVR coaches, managers and parents are immensely proud and congratulate the girls for their outstanding performances, discipline, sportsmanship and mostly for their results in the league. Swiss Valley Rangers Football Club turned up to support the Marine Conservation Society’s UK Beach Watch event at Ladye Bay in Clevedon last weekend. This is regarding the plastic pollution being washed out from our shores and making its way into the ocean. As a community club, we are passionate about our environment, not just about football, and are proud to do our bit. 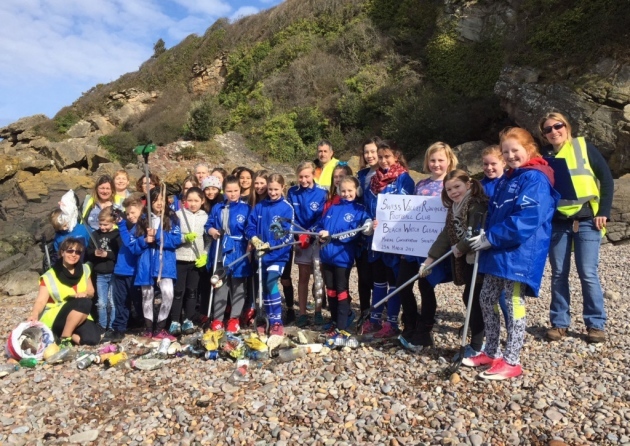 The amazing children and adult volunteers worked hard to clean up the beach, especially finding the hidden rubbish that was stuck between the rocks. The Club would like to thank North Somerset Council for supplying the equipment and permitting the event. We would also like to thank the Marine Conservation Society UK for approving Swiss Valley Rangers as the organiser for this Beach Watch event. 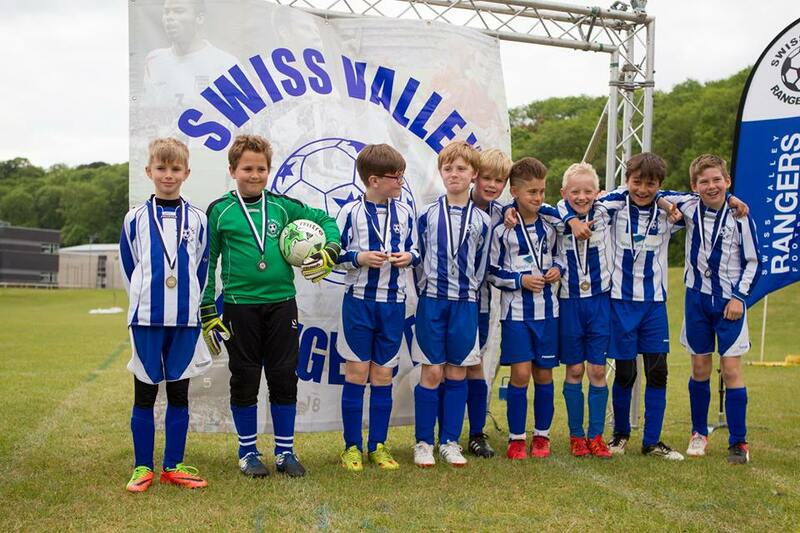 The Swiss Valley Rangers Annual Presentation evening took place at the weekend and brought the curtain down on a fantastic season of football. Split into two sessions for the first time due to the growth of the Club, the evening kicked off with recognition for members of the SVR Committee who do all the work behind the scenes to keep the Club safe, to get games on and to keep things running. Then team by team we heard about everyone’s season culminating in individual awards for each age group: Manager’s Player of the Year, Most Improved Player and Players Player of the Year. Richard Bowen, U18 Manager received a special Club recognition award for all of his years’ service in charge of the age group as they left junior football and attended their final Swiss Valley Rangers event. Have a fantastic summer everyone – looking forward to 2017/18!! After months of planning, around 400 children enjoyed the Club’s third annual football festival. Preparations weren’t ideal, with torrential rain the night before making our band of helpers soaked through, but the marquee kept people out of the worst of it and oodles of pizzas keeping spirits high! The rain did have a benefit – an unusual dry spell in the weeks leading up to the tournament had made pitches dry and bouncy, so the wet weather was much appreciated and made our renowned pitches absolutely perfect for the day of the festival. Thank you to everyone who helped make the festival a success and especially to all the Clubs who participated and made it the day it was.